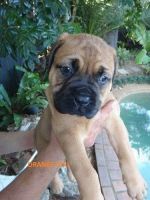 Bullmastiff breeders links and breed information on pups4sale.com.au. pups4sale testimonial: ....all puppies are sold. Great site. All 8 sold in 4 days. The Bullmastiff has been a popular breed for its size and looks for years, but in recent years has been a worldwide hit because multiple Bullmastiffs have been featured in popular movies. 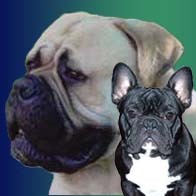 Bullmastiffs can be found all over the world and are generally considered to be a great breed. 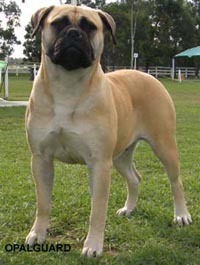 The Bullmastiff is a large breed that came around in the mid 1860s from a cross between Mastiffs and Bulldogs. They have long been known as fantastic watchdogs, but have now become well known for being all-around great family pets. Bullmastiffs aren't as large as other Mastiffs, but they are still a pretty large breed. 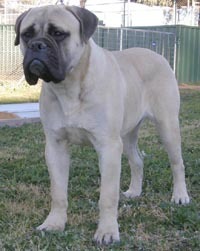 At full size, a typical Bullmastiff will be very solidly built with a broad head and a short muzzle. Both sexes will get to be just over two feet tall, with the males growing to be about 110-130 pounds, and females 100-120 pounds. 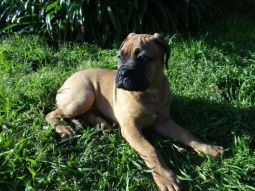 Thanks to Opalguard Bullmastiff Kennels for the photos of Bullmastiff adult dogs & puppies used on this page. 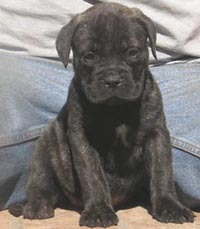 Bullmastiffs come in red, fawn, and brindle, which are three equally beautiful colors for the breed. Though not common, some Bullmastiffs are born with either one large white patch on their chests or multiple white marks.One of the great things about the Bullmastiff (besides their personalities) is that they don't shed as much as other large breeds. While they do shed a little but each year, their short, thick coat only requires minimal grooming. You might not think it by looking at them, but Bullmastiffs are some of the kindest dogs around. They are very caring and are very gentle with people by nature. Some Bullmastiffs may look goofy, but they are intelligent enough to be solid farm animals and take pride in learning new things. They are far more dominant than any other Mastiff breed, so while they are great pets, it takes a bit more time for them to learn who's boss.Bullmastiff puppies get pretty big in a short time span, so owners have to be prepared to deal with typical puppy issues from dogs the size of most adult breeds. They are a bit slow to learn compared to other breeds, but they respond well over time.Bullmastiffs are fantastic family dogs, so they get along with children swimmingly. They know when they need to be gentle and are as calm as can be no matter how children act around them. It's not uncommon for people to be surprised when they see how well Bullmastiffs are with kids.While it's not uncommon for Bullmastiffs to get along with other animals, if they grown accustomed to being the only animal in the house, they do have the tendency to want the house and its residents to themselves. On the other hand, a Bullmastiff that grows up with other animals will get along with them splendidly even into adulthood. Bullmastiffs can be trained to socialize properly with other animals, but their instinct is to always protect their masters, so they will usually not trust other dogs initially.Bullmastiffs are some of the best guard dogs around because they are one of the most alert breeds that you can find. Even though they aren't the most aggressive dogs, they will take an intruder down with their natural strength and will do so quickly when they sense any type of danger. 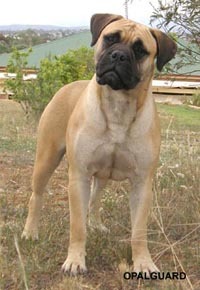 On top of that, Bullmastiffs usually intimidate people who see them for the first time, so they will often scare off intruders by just simply looking the way they do.Like most other large breeds, if a Bullmastiff needs to be left alone for a few hours, it should have enough space to move around freely. They should be okay if only left alone for a few hours a week, but too much can lead to them feeling abandoned, which leads to minor depression. Bullmastiffs need owners who are willing to work hard with them because they don't respond well to passive owners. You don't have to (and shouldn't) be aggressive with Bullmastiffs, but you to have to show them who is boss repeatedly to get through to them early on. 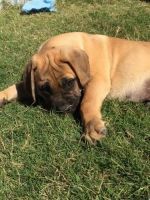 Most first time dog owners will have a tough time training a Bullmastiff, which is why most kennels don't recommend them as a great first dog. Of course, it's not impossible for first-time dog owners to properly train a Bullmastiff.Bullmastiffs have on-track minds, so once you get them to focus on working with you during training, they can learn just about any command. Their stubbornness can sometimes get in the way, but repetition is all it takes once they know who's in charge.This may all make it seem like it is difficult to train Bullmastiffs, but the fact is that they are very trainable as long as the training lessons are consistent and are done by an owner who knows how to deal with this breed. It's a breed tat can be found in multiple Hollywood films, so they have to be trainable, right? Like most larger breeds, Bullmastiffs need regular exercise to both keep their bones and muscles health and to keep them happy. They will gain weight quickly if they are not given regular exercise. Multiple walks aren't necessary, but it is imperative that they get walked at least once a day.Bullmastiffs are usually good walkers, but they should be taught to stay close to you in case new dogs or other animals happen to walk by. As long as they know to pay attention to what you say during walks, they will act properly.Bullmastiffs love exercise, so not giving them their regular walks and a backyard to play in can lead to restlessness and depression. While shedding isn't a bad issue with Bullmastiffs, they should be brushed on a regular basis to keep their coat nice and clean. Be sure to brush in their most wrinkly areas to avoid hair buildup in those areas.You may think that Bullmastiffs get dirty a lot and need many baths, but in reality they are relatively clean and should only be bathed when required. Of course, when they're younger, they will get dirty pretty often, so more baths will be needed.Bullmastiffs may not have as many brushing needs as other dogs, but they will need weekly teeth brushing to avoid bacteria buildup. They also tend to have some pretty stinky breath after a week, so avoiding that will be good for anyone who wants a kiss from their Bullmastiff.Another plus when it comes to grooming is that most Bullmastiffs will naturally wear off their nails, so trimming isn't necessary most of the time. You'll just have to listen for when they start to click on tile floors or pavements. Because the Bullmastiff is a larger breed, their lifespan is shorter than most breeds, typically living between 8 and 10 years. A few of the most common health issues with Bullmastiffs are hip dysplasia and cancer.Bullmastiffs gain weight very quickly, which makes them susceptible to bloat. Owners should make sure that their Bullmastiffs are fed smaller meals rather than a single large meal to avoid these health problems. A lot of people want to own Bullmastiffs because of their size and lovable personalities, but it's important that owners knows how to handle this breed before they commit to one. 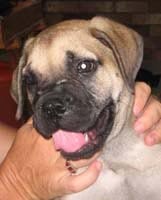 Owners who know how to take charge and really take the time to teach a Bullmastiff how to act could be perfect Bullmastiff owners.Owners must have a house large enough to accommodate a Bullmastiff because this breed will not be happy in a smaller living environment. While a large backyard isn't totally necessary, it would give this breed space to roam around and keep in shape in between walks.Bullmastiffs are known as great dogs because they are usually with owners who know how to give them great lives. If you know that you can do this, it may just be a perfect fit. 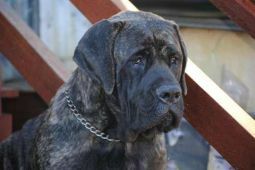 It's a fact that Bullmastiffs usually learn to love and respect anyone who takes care of them, but their specific needs call for a specific kind of pet owner.For example, a person who works a lot and just doesn't have time to regularly train and walk their pets should not own a Bullmastiff. Also, if you have an apartment or a small townhouse, a Bullmastiff will have a hard time being comfortable because of their requirement of big living spaces.You may really want a Bullmastiff, but if you can't meet a Bullmastiff's requirements, no one is going to end up being happy in that arrangement. 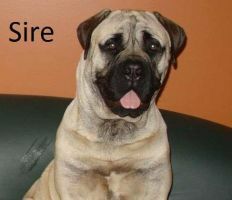 There are a lot of breeds out here that don't require as much attention and space as Bullmastiffs do, so if you know or are unsure if you can take care of this breed, another one will probably be better for you. It's hard not to love Bullmastiffs because they are huge, have an adorably ugly face, are active, and are great family dogs. They are great dogs that any pet owner would love to have.